Karsten Schubert and Thomas Dane Gallery, London In 1959, Bob Law lay in a Cornish field and wondered how to describe the space he was in. His solution was a series of drawings in which figurative elements – such as trees or houses – are arranged along a doddery pencil line at the perimeter of the paper. A year later, Law had distilled this approach to his signature device: the rectangular perimeter alone, bounding empty space, sometimes accompanied by a date, a title or his name, always in block capitals. This two-handed retrospective, split between the galleries of Karsten Schubert and Thomas Dane (and organized in association with Richard Saltoun), pivoted upon these abstract works and their ongoing relationship to the figuration which informed them. At Thomas Dane, Drawing 7.7.65 (1965) – a classic example of Law’s wobbly-edged Minimalism ­– opened the show, hung opposite some of the artist’s later landscapes: Looking to France from Sandgate Esplanade 1992 and Looking to Calais from Abbots Cliff (both 1992). Nearby, Lost in the Milky Way 9.2.87 1987 (1987) is a rectangle of Van Gogh-esque swirls. Each spare, almost childlike, drawing pokes at the limits of a pencil line’s ability to summon the very grandest of panoramas. Their success is also their failure. While, as the exhibition’s press release contends, Law was ‘arguably the foremost British Minimalist artist of the 1970s’, exhibiting at Konrad Fischer Galerie in Dusseldorf and Lisson Gallery in London, he somehow slipped from view during the 1980s and ’90s. In these years, Law, who died in 2004, was increasingly preoccupied with sculpture, a concern that stemmed from and existed alongside his work as a carpenter. On display at Thomas Dane was a selection of bronzes, arranged on a table in the centre of the gallery. Variously identified as obelisks (for example, Roland’s Obelisk, 1985) or castles (Castle CCCLI, 2003), these diminutive, abstracted edifices are lent a doughy quality by the green patina of their smooth surfaces. (I was reminded of the ‘little boxes made of ticky tacky’ in Malvina Reynolds’ satirical 1962 song about suburban housing.) They were clearly three-dimensional articulations of the ‘castles’ that appeared in the paintings and drawings in the same room: each consists of three rectangles of decreasing size stacked on top of each other – the simplest, silliest castles imaginable. From without, a castle is a defensive structure – an impenetrable ring around an absent core; from the inside, it can stand for the entire world. In these works, Law is not just talking about the formal qualities of the image or object (the hard skin of the bronze harbouring the solid void within), nor are these purely philosophical ruminations on absence and presence, plenitude and emptiness. These bronzes are expressions of a sense of ‘being in the world’ quite common to experiences of landscape: loneliness, singularity and the simultaneous feeling of physical smallness and imaginative, all-encompassing enormity. 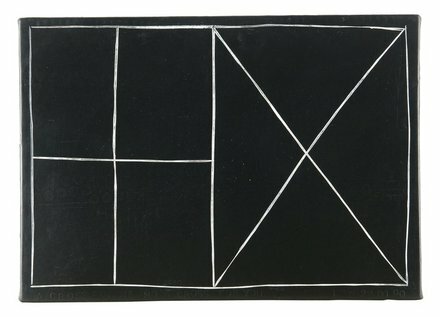 The title of the large painting in the next room, a black rectangle on sandy-coloured canvas, acknowledges precisely this psychological anxiety: Mister Paranoia V 21.8.71 (1971). The second half of this retrospective, at Karsten Schubert, presented a more polished, less self-effacing and – dare I say it – less British side of Law’s practice. The highlight here was the painting Long Black Mirror IX (1980), a panoramic monochrome of velvety black acrylic. Its Perspex casing reflected the viewer’s image framed in widescreen, although, oddly, on my visit I was told that the case was there purely for conservation reasons – presumably, without it, the ‘mirror’ effect can only be imagined. Two works from Law’s ‘Black Watercolour’ series (1987–8) also hung in a room devoted to black monochromes. In these works the artist layered primary colours in varying combinations beneath black paint, achieving exquisite depths of tone. These works brought to mind the square-shouldered assurance of Ad Reinhardt or Richard Serra’s early work – or the bravura of Anish Kapoor – rather than the hesitant, slightly neurotic works at Thomas Dane, which revealed instead the influence of St Ives artists such as Peter Lanyon and Ben Nicholson. In the next room, the heavy bronze of Law’s tabletop castles had been swapped for seemingly weightless chrome in Obelisk for a Day (1999), a three-metre spike that shot towards the ceiling and ended in a pyramidal roof. Other small paintings revealed one of Law’s idiosyncrasies: while dates are usually inscribed quite clearly on his paintings or drawings and often feature in the titles themselves, they do not always match the year given for the works in the inventory. The painting Splitting a Double Cross 28.01.00, for instance, was produced in 2003. Apparently Law simply liked the effect the characters gave, and was equally fond of Roman numerals. Like castles and obelisks, they are redoubtable symbols of authority, secretly harbouring all manner of paradox and ambiguity.